A beautiful evergreen border plant for a not too dry, nutritious but well drained soil. In addition, he likes the sun. Height and color varies by species. There are varieties with semi-double flowers. 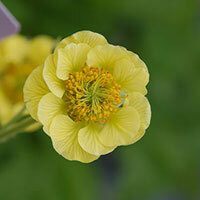 This repeat-blooming Geum is an exciting breakthrough. The plant bears a summer-long display of small, rounded semi-double scarlet flowers, held on wiry black stems above a low clump of dark-green leaves. 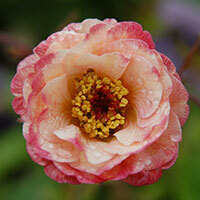 This stunning new hybrid produces clusters of beautiful semi double and ruffled apricot flowers with a rose blush. 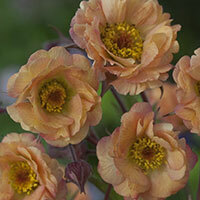 Perched atop burgundy stems the flowers lighten to soft peach as they mature. A popular variety, with a long flowering season and semi-double, vivid scarlet flowers that appear from June to August among rosettes of puckered, scalloped fresh green leaves. 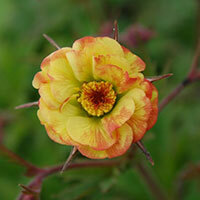 This easy-to-grow geum looks best among other ‘hot’ coloured flowers towards the front of a sunny border. 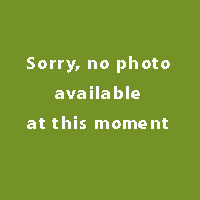 This plant is highly suitable for the ornamental garden. She has striking leaf, flowering, or form and is easy to combine. Calls for a sunny spot and well-drained, nutrient-rich soil. This plant is highly suitable to combine with the ' base ' plants. Tolerates short periods of drought just fine. On the other hand, wet winters. Plastic diamond mesh and grows is hard to combine with other plants.